UPDATED JUNE 1, 2017 DRAUGHTSMAN MODEL 118 PERIOD 1935 — MONTUORO GUITAR CO.
copyright 2019 The Montuoro Guitar Co. LLC. Inc. I started my career in the 1980's, when I moved to Los Angeles and began working at a vintage guitar facility. I worked on guitars used by Bob Dylan, Joni Mitchell, Neil Young, and Peter Frampton to name a few. Keeping guitars in great running condition and continuing my journeyman experience, I realized a very important thing - it’s not just the guitar. It’s the person playing the guitar that makes the instrument sound great; the instrument does not play itself. A Luthier must cater to the needs of the player and I have always felt that a good Luthier would make great shrink. I continued to listen and work with some of the most inspirational people in the world. I feel that sometimes I learned more about my craft by just being thoughtful towards what someone expected out of their guitar, than by how many thousands of an inch the low E string was from the fingerboard. I believe the guitar is a living and breathing entity, much like ourselves, and they all have their own limitations. I continued my tenure in California until I found what I had waited a long time for, the opportunity to work with a master. I moved to the great Pacific Northwest to study under John Stephan. John has been the most inspirational part of my journey, a master craftsman from Palmer, Alaska with Houdini like skills. Together we forged a guitar bond that will last forever. John was an amazing teacher. His entire focus was on “what not to do” rather than “what to do". He felt I had my own facility and I should capitalize on it; the rest was up to me. I am indebted to him forever. Many of you may never see his work, but if you look close you can see it in mine. He is my "Guitar Father.” But, as the saying goes, I guess all good things must come to an end and John had to eventually set me free to do my own thing. While working at Dusty Strings I received a call from Luthier Bill Asher of Guitar Traditions in Santa Monica, California. It was an opportunity to help Bill get through at least 200 guitars in need of restoration, and I was up to the task. Having the chance to work alongside Bill on some of the finest guitars ever made and further my journey was another enriching experience. Bill hails from Rick Turner’s world and has a keen eye for detail. It helped keep me on my toes to the point where our work was one and the same. I spent 3 years working at Bill’s shop until I had the burning desire for my own. I went a unique route and moved to San Juan Island on the Pacific and built my humble little shop in the trees. Going where it is quiet I felt I could hone my skills. Some of which was a passion for guitars built by the infamous Larson Brothers. While at Guitar Traditions I met a client who had a 30's Larson made Stahl that he had purchased from George Gruhn’s Guitar Shop. Purchased “as is” and in “need of fixing.” Not being familiar with them at the time I began my research and the more I looked, the more excited I got. That takes me to where I have been for the last 8 years, in the land of the Larson Brothers. I truly feel that Larsons are some of the finest made flattop steel string instruments to date. The progressive nature of their work is so captivating to me that it has inspired me to think about and understand so many new things about guitars. The Larson’s figured out a new interesting swing on that wheel idea that worked and still does. There is nothing out there that sounds like a Larson; that is subjective of course, but few would disagree. In the past 8 years I’ve become somewhat of a specialist in the Larson realm of refurbishing, working on well over 300 of their creations. Every instrument I received basically needed to be rebuilt, and each project has had great results. I’ll also continue to build to order and welcome whatever you might dream up. To insure consistency in the product, I work alone, building only 10 to 12 guitars per year. My principles for acoustics are inspired by what I have learned over the years through restoration work and in my opinion a new guitar can be made in a fraction of the time it can take to do most detailed restoration work. I will continue to be available to do fine restoration work, keeping our old friends healthy and performing at their best, with much respect for where they have been and the great music they have made. I really appreciate you taking the time to look over my bio, to see where I am coming from and where it is I plan to go. 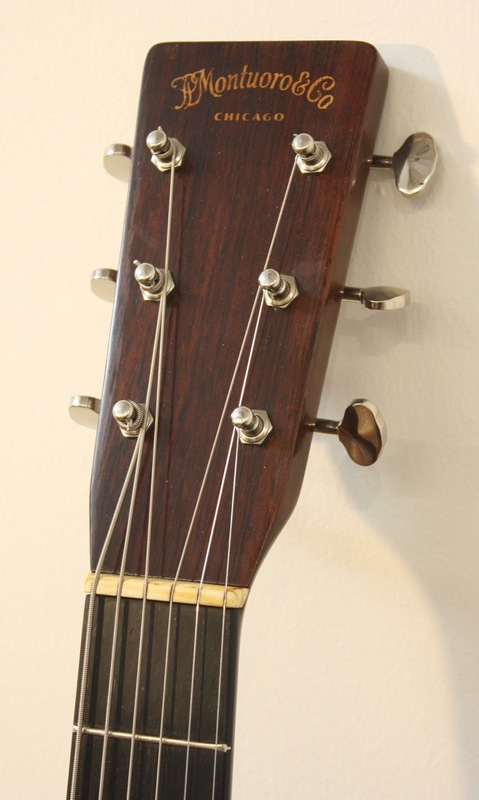 "The Guitar Headstock Configuration is a registered trademark and is used under license by Montuoro Guitar Co. from C.F.Martin & Co., Inc. of Nazareth, Pennsylvania, USA." Montuoro Guitar Co. hand built tribute guitar. Based on the period 1935. Weighs 4 lb 3 oz. One interesting difference between the guitars made in 1934 & 1935 is the body dimensions. The lower bout, waist and upper bout are generally a bit narrower, roughly somewhere around 1/16" to 1/8". Also the depth of the body is slightly deeper. In oddly enough those same proportions. Outfitted with Montuoro Guitar Co. replicated Grover G-98 tuners with a 6:1 tuning ratio and rivet. These tuners are solid brass and have been nickel plated. As well as the classic brown celluloid pick-guard material. I have been stringing the Model 118 & Model 228 with John Pearse #980M. These are Pure Nickel Wound Mediums .013 to .057. Nickel strings, or at least round-core strings are much better suited for vintage instruments. 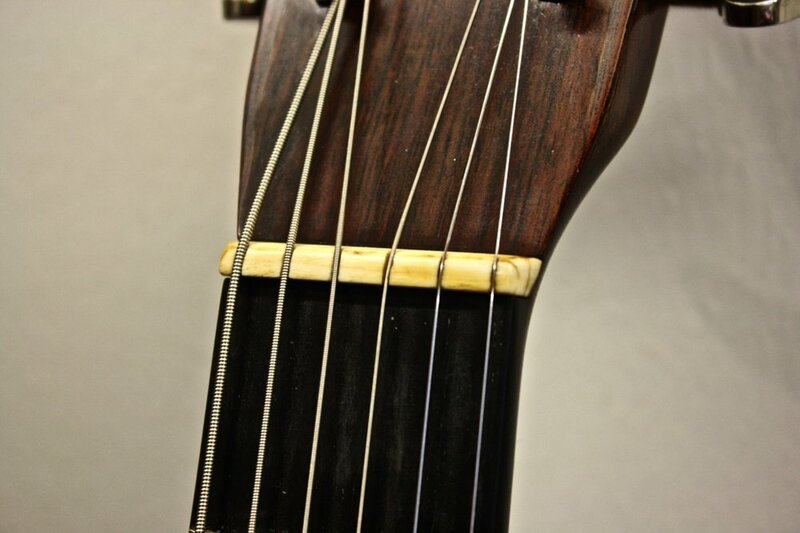 The reason being is the round-core does not impart as much string tension. Which can be very damaging to older guitars. I always keep in mind that it wasn't until 1974 that the hex-core string was created. Jim D'Addario had come up with the concept which allowed for much more consistency with machine winding. The winding will wrap itself around the hex-core more even and consistent. The only issue I have is, even this slightest change in surface area makes the string to string tension too far apart from each other. If you like a thicker string gauge the round-core strings are a great substitute for the larger string mass, without all that extra tension. Depending on the scale length, you could be looking at close to a 30 lb tension difference.